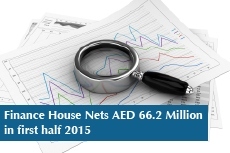 Finance House PJSC (FH) has registered a robust consolidated net-profit of AED 66.2 million for the six months ended 30 June 2015, which is 8.3% higher than the consolidated net-profit of AED 61.2 million achieved in the corresponding period of the previous year. Earnings per Share (EPS) for the six months ended 30 June 2015 jumped 21% to 23 fils per share from 19 fils per share in the same period last year. On the back of a sustained growth in the lending book and targeted expansion of the fixed income portfolio, Net interest income and income from Islamic financing and investing assets grew by an impressive 46.7% YOY to reach AED 93.4 million during the first 6 months of 2015 compared to AED 63.7 million in the corresponding period of the previous year. Net Fee & Commission Income was however lower than the previous year due to lower brokerage revenue from subdued activity in the domestic equity markets during the first 6 months of 2015 compared to the same period in 2014. Income from a well-diversified proprietary investment portfolio stood at AED 70.3 million, which is 5.4% higher than the investment income of AED 66.7 million registered during the same period of the previous year. As a combined result of the above, Total Operating Income for the half year ended 30 June 2015 increased by 14.4% to AED 183.4 million compared to AED 160.3 million in the same period of the previous year. Due to continued expansion in business activities of the Group, Total Operating Expenses were higher at AED 92.7 million compared to AED 80.8 million in the same period last year. In line with its conservative approach towards impairment provisioning, FH has set aside additional impairment provision of AED 24.5 million in the first half of 2015 compared to AED 18.3 million in the same period last year. Total Assets grew by 5.1% YOY to reach AED 4.73 billion as of 30 June 2015 compared to AED 4.50 billion at the same time last year. However, Net Loans & Advances including Islamic financing and investing assets grew by a robust 19.8% YOY to reach AED 2.07 billion as of 30 June 2015, compared to AED 1.73 billion at the same time last year. The resultant Loans to Deposits ratio as of 30 June 2015 stood at 81.2%, leaving ample room for growth in lending book in the near term. As at 30 June 2015, Shareholders’ Equity stood at a healthy AED 749.5 million compared to AED 703.9 million at the same time last year, whilst the Capital Adequacy ratio on a risk weighted basis at the consolidated level stood at a robust 19.9%. In line with its cautious approach to liquidity management, Cash and cash equivalents as of 30 June 2015 stood at a very comfortable level of nearly 16% of Total Assets.